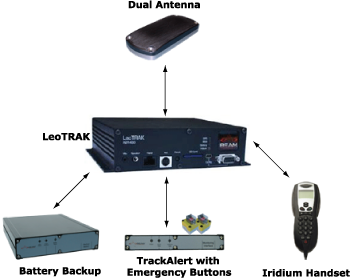 The fixed tracking solution integrates a LeoTrack unit, the TrackAlert interface with accompanying emergency button, backup power, and an integrated Iridium / GPS antenna. If voice is required, the intelligent handset is incorporated providing a full tracking and voice solution. Fixed tracking devices are ideal for aircraft, boats, or vehicles.